Robert Salanitro specialized in children's book and illustrations with humors; he worked as a freelance cartoonist for CanadaPharmacyOnline.com. Have you heard? People are getting lice from taking selfies with their friends. Yes, it’s true, according to Lice Clinics of America, when your head touches someone else’s for a selfie, lice can crawl. Martha and Carol are two best friends that encountered this problem, well maybe not best friends anymore. Martha is someone that loves taking selfies of herself. Anywhere she goes, whether to a shopping mall, work, airplane, park, Martha makes sure she has her cell phone and ready to take a selfie of herself. It wasn’t until one day Martha invited her best friend Carol to her house for coffee and cake. As predicted Martha was ready to take a selfie of herself and her best friend Carol. They posed together head to head and gave the biggest smile. After the picture, maybe twenty minutes later, Carol’s scalp started to feel very itchy. 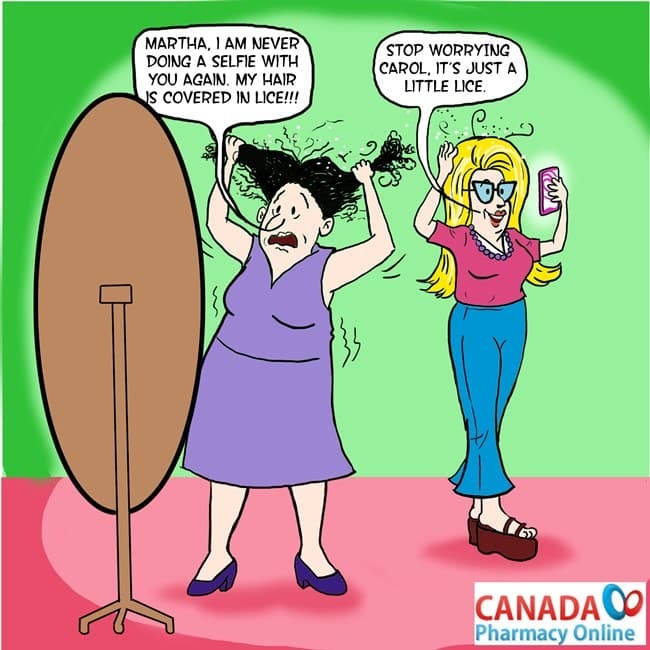 She soon learned why her scalp was very itchy, she had gotten Lice from Martha. She looked into mirror and said, “Martha, I am never doing a selfie with you again. My hair is covered in Lice!!! Martha just replied “Stop worrying Carol, it’s just a little lice" as she continued to take selfies of herself. Well, Martha and Carol continued to stay friends but they sure weren’t best friends anymore. Very cute vid. Some day, I hope I can show you some pics we have of our cats with our mice on their he.ds.pas., Seconded: You are indeed awesome.